KFC, which in recent years has focused on marketing stunts like fried chicken bath bombs and gravy cocktails, is testing out a new menu item that you might actually want to eat: fried chicken and waffles. Brunch, meet bucket. Customers can partake in what hipsters have been happily gobbling up at brunches across the country for years when they order Belgium liege-style waffles and fried chicken at the chain's restaurants in Asheville, Greenville, and Charlotte, North Carolina. 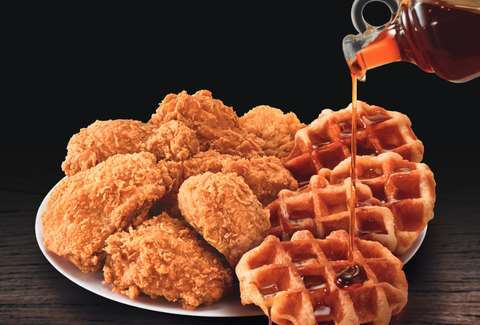 “We know that chicken and waffles has a cult following across the country, especially in the south, but not everyone has it available close by,” Mike Wesley, KFC's senior marketing director, said in a statement. Wesley added that he's "excited to hear what North Carolinian taste buds have to say" about fast-food chicken and waffles. If the dish's popularity is any indication, KFC should probably try to expand menu item across the country. But given recent history, the company might just make Colonel Sanders isolation tents instead.